Now this is the point. You fancy me mad. Madmen know nothing. But you should have seen me. You should have seen how wisely I proceeded—with what caution—with what foresight—with what dissimulation I went to work! I was never kinder to the old man than during the whole week before I killed him. And every night, about midnight, I turned the latch of his door and opened it—oh so gently! And then, when I had made an opening sufficient for my head, I put in a dark lantern, all closed, closed, that no light shone out, and then I thrust in my head. Oh, you would have laughed to see how cunningly I thrust it in! I moved it slowly—very, very slowly, so that I might not disturb the old man's sleep. It took me an hour to place my whole head within the opening so far that I could see him as he lay upon his bed. Ha! 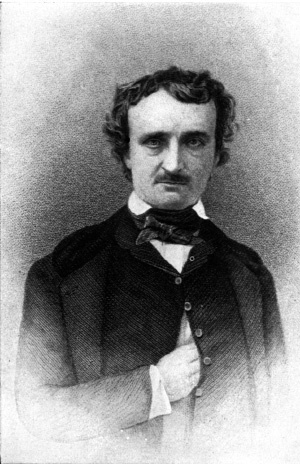 would a madman have been so wise as this, And then, when my head was well in the room, I undid the lantern cautiously—oh, so cautiously—cautiously (for the hinges creaked)—I undid it just so much that a single thin ray fell upon the vulture eye. And this I did for seven long nights—every night just at midnight—but I found the eye always closed; and so it was impossible to do the work; for it was not the old man who vexed me, but his Evil Eye. And every morning, when the day broke, I went boldly into the chamber, and spoke courageously to him, calling him by name in a hearty tone, and inquiring how he had passed the night. So you see he would have been a very profound old man, indeed, to suspect that every night, just at twelve, I looked in upon him while he slept. Interpret the foreshadowing, or clues about what might happen next. Choose the statement that best describes the kind of events the author is foreshadowing in this paragraph. The paragraph suggests that this will be a story about the narrator's excellent sense of hearing. The paragraph suggests that the story will involve events that call the narrator's sanity into question. The paragraph suggests that this will be a calm story about a healthy person. Now you can be creative and mix up your own foreshadowing for the story. What kind of central theme or future event do you want to foreshadow? The narrator will tell a tale of leadership and power. The story will focus on the narrator's recovery from an injury. The story will be about a great escape. Choose from the pull-downs to create your new foreshadowing. Remember your goal as you choose! Click "Done" when you are ready. Use the Text Help toolbar located above to highlight and collect the words and phrases that provide the foreshadowing in this passage. Paste them into your word processor and write, sketch, or discuss your response. The narrator seems to be cautious, kind, and eager to tell the story. The narrator seems to be quiet, wise, and honest. The narrator seems to be deceptive, calculating, and psychologically unstable. Now you can be creative and mix up your own characterization. What kind of character would you like to make the narrator? The narrator will be covetous but will claim to be generous. The narrator will argue truthfully that he misses the old man's company. The narrator will be faint-hearted but will claim to be heroic. When I read this paragraph, I focused on the narrator's repeated insistence on not being crazy. This point seems important to the narrator, so it made me think the issue of the narrator's sanity will be central to the story. When I am trying to understand foreshadowing at the beginning of a story, I look for clues about where the narrator seems to be focusing. Sometimes when words or ideas are repeated, it means they refer to something—an event, question, or problem—that will be central to the story. Are there objects, sounds, lighting, or scenic elements that suggest a feeling of happiness, sadness, danger, excitement, or another emotion? Do characters or the narrator make an observation that might be a hint about something to come later? I changed the paragraph to foreshadow a tale of leadership and power. When I substituted the new words and phrases, I noticed that the narrator's personality also seemed to change. When I create foreshadowing at the beginning of a story, I try to make reference to some events or themes that will be important later in the story. When I read this paragraph, I focused on the narrator's repeated insistence that he is not crazy. This point seems important to the narrator, so it made me think the issue of the narrator's sanity will be central to the story. When I read this passage, I realized it might not make sense to trust all of the narrator's claims. The fact that he has committed murder seems to overshadow the other things he says about himself. When the narrator is also the main character of a story, I pay close attention to the narrator's claims about his or her personality—and whether those claims actually fit with the narrator's actions. I chose to change the narrator into someone who sincerely missed the old man. I thought that changing the narrator's action at the end was really what made him seem like a different kind of person. When I am choosing words and phrases to make a new kind of character, I use adjectives to describe appearance, or I describe actions or thoughts that signal the reader about what the character is like.